With Spring and the New Year upon us, our first Holy Fast Days approach. Many might not realize instead of “feasting” they should be fasting. This is because humans like to eat and don’t like “to be told” not to eat. Yet, the Bible says to hold fasts. The fasts were about feasting, but centuries later, people have redefined the word to mean eating large meals, holding banquets and buffets. Back in the day, they did make large meals during the Holy Feasts, because no one within their gates was to go hungry. This symbolically meant everyone was fed, with the Word too. A sacrificed lamb fed a large number of people his or her portion, not just a family of four. Now, a small number of people eat a large amount of food; and think that it is not only an honor, but also a God-given right. As gluttony is a deadly sin, it’s not likely to be a right-of-passage to the Hereafter. Many within our gates, or world, go hungry. But the sad reality is that the whole world is starving for the Truth, the Word. So many people dish out their versions of the Holy Feast Days, which include buying a bunny-suit and playing Peter Rabbit. Inspired by the clergy, man has continued to replace the first Holy Days with something called Easter, honoring the fertility goddess Ishtar/Easter. No one can say, “No, no, it doesn’t mean that” and continue to hop down the bunny trail. If one is “buying into” Easter, he is selling-out. If people buy Easter-baskets, play along with egg-hunts, buy Easter dresses, buy Easter lilies, buy greeting cards, buy chocolate bunnies and Ishtar-eggs (eggs are a sign of fertility – no eggs – no babies), buy a Ham, buy all the side dishes; and partake, then they’ve technically bought into the market system which was designed to be a transfer of money and destroy our physical world, buy-consuming it. Spiritually, it was designed to get everyone to move away from God, and destroy them. What do bunnies and eggs have to do with The Crucifixion? Absolutely nothing! You’ve all been deceived, by the clergy, into worshipping Ishtar, instead of God. There is no reason to “Hold Fast” if the weightier matters of the Law are to be ignored. If someone picks and chooses which Laws he wants to obey, like they are a buffet of choice, and are based on his personal likes and dislikes, then he is missing the point of “KEEP, DO, and OBEY ALL GOD’S LAWS”. And keeping them requires Will-Power. Picking a select few and disregarding the rest still leads to Hellfire. The Bible says if one loves God above all else, he is incapable of breaking the Laws – this requires careful study, because if one breaks all the Laws and claims he loves God above all others, is he being truthful? Remember this Commandment – Thou shall not lie. This means even to one’s self. The Holy Feast Days take us through all the days of our lives, which include affliction, redemption, sowing, growing and harvest, then burning the chaff and fruitless vines; and everything made anew again after all evil is destroyed. First came Passover with the crucifixion of Jesus, the Lamb without blemish, which replaced animal sacrifice with that of self-sacrifice, which is the daily control of your spirit over the self. The Feast of Unleavened Bread was to be performed to remember our days of affliction, slavery and oppression. The Bread of Affliction is the Unleavened Bread eaten for the evening meal during fasting, maybe with a small amount of stew. It isn’t just unleavened bread or crackers to lay on top of a pile of food. We don’t really remember affliction and those days are coming around again, if one has taken notice. Leaven is yeast, and all rising agents are not yeast. Yeast infects the flour and changes its being/character, and spreads throughout the dough. Yeast makes bread puffed-up and is symbolic of the sin of the self being puffed-up with pride and arrogance; “Then Jesus said unto them, Take heed and beware of the leaven of the politicians and of those that deny the Hereafter (Matt. 16:6).” During the Feast of Unleavened Bread, we were to remain free of leaven, or symbolically free of sin. This is what Jesus Christ’s sacrifice meant. His sacrifice washed our past sins away, but we’ve racked them up again since then, when we were allowed to start eating leavened bread, or sinning. There was once a time of great celebration, because of redemption through Jesus. Yet, these last generations have grown wicked, because we didn’t keep the Laws Jesus reinstated. Not only did Jesus replace animal sacrifice, He also became the Wave Offering, the Drink Offering and the Firstfruit. 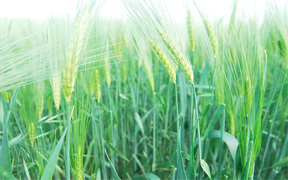 He was the first sheaf of barley offered to God; and could give new meaning to this scripture, “Seven weeks shalt thou number unto thee: begin to number the seven weeks from [such time as] thou beginnest [to put] the sickle to the corn (Deut. 16:9).” Christ is the Bread of Life and Without Sin, Unleavened – humble. 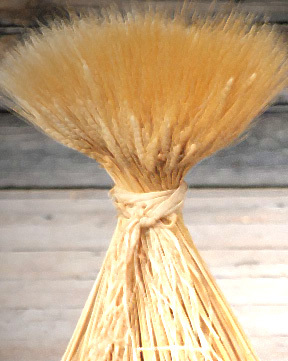 He remains the first sheaf offered to God, waved. As the Lamb, He was slaughtered. As the perfect sheaf, He was symbolically hewn down with a sickle – CUT OFF – “And after threescore and two weeks shall Messiah be CUT OFF, but not for himself: and the people of the prince that shall come shall destroy the city and The Sanctuary; and the end thereof [shall be] with a flood, and unto the end of the war desolations are determined (Daniel 9:26).” We crucified Jesus on Passover Day, the 14th Day of the First Month of Spring. His crucifixion was the Second Passover as He was the Lamb that was killed and His blood covered and paid for our previous sins. 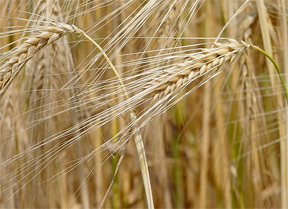 “And Jesus said unto them, I am the bread of life: he that cometh to me shall never hunger; and he that believeth me shall never thirst (John 6:35).” We no longer live in an agricultural environment; and cannot truly offer real firstfruits, we offer ourselves, just as Christ offered His self. Jesus became the Wave Offering and the Drink Offering. These offerings were described in Leviticus as something we were to do when we came into our promised land – when we got settled. And we were established when Jesus entered Jerusalem; just like we are established now. The First Feast of Firstfruits would run concurrently with the Day of Unleavened Bread and Feast of Unleavened Bread. “Now the Feast of Unleavened Bread drew nigh, which is called the Passover (Luke 22:1). Then came the day of Unleavened Bread, when the Passover lamb must be killed. And he sent Peter and John, saying, Go and prepare us the Passover, that we may eat. And they said unto him, Where wilt thou that we prepare? And ye shall say unto the goodman of the house, The Master saith unto thee, Where is the guestchamber, where I shall eat the Passover with my disciples? (Luke 22:7-11).” This meal is described in the Old Covenant as appropriately one with flour, but not leaven. “And the meat offering thereof [shall be] two tenth deals of fine flour mingled with oil, an offering made by fire unto the “I AM” [for] a sweet savour: and the drink offering thereof [shall be] of wine, the fourth [part] of an hin. (Lev. 23:13).” When the observance of the 50-day Feast of Weeks is over, there is a Feast Day from the second harvest, which includes leaven. “Ye shall bring out of your habitations two wave loaves of two tenth deals: they shall be of fine flour; they shall be baken with leaven; [they are] the firstfruits unto the “I AM” (Lev. 23:17).” This would represent the gathering that was done by those who spread Christ’s message. Again, if we miss the spiritual point of offering up ourselves, then it’s unlikely we’ll do anything correctly. The Feast of the Weeks time is about rejoicing because of Jesus’ sacrifice, as the Second Passover Lamb. We were to go plant seeds and spread His message of keeping the Laws of God. We were supposed to do this until the final harvest. There would be no point in creating FEAST or MEMORIAL days, if there was nothing special we needed to do in them. We must sacrifice in them. We must fast. God is reprimanding us for choosing our own days to fast, and while fasting can be a free-will offering outside of specific dates from God to fast, we weren’t supposed to delete and move these specific dates to suit ourselves, “Is it such a fast that I have chosen? a day for a man to afflict his soul? [is it] to bow down his head as a bulrush, and to spread sackcloth and ashes [under him]? wilt thou call this a fast, and an acceptable day to the ‘I AM’? (Isaiah 58:5).” Feast Days are Sabbaths and some are set aside to include no work. Feast Days are treated separately from the rest of our days. Weekly Sabbaths occur every seven days, “Six days shall work be done: but the seventh day [is] the Sabbath of rest, an holy convocation; ye shall do no work [therein]: it [is] the Sabbath of the ‘I AM’ in all your dwellings (Lev. 23:3)” Then, God made other special ones such as the Passover. And a day is counted from sunset to sunset. “And God called the light Day, and the darkness He called Night. And the evening and the morning were the First Day (Genesis 1:5).” The morrow of a day is the morning, daylight hours. Passover begins at sunset on the 13th, because that is when the 14th actually begins. Because self-sacrifice replaced animal sacrifice, the human body is the “meat” of our self-sacrifice. We are the meat offerings. This has nothing to do with killing the human body; but has everything to do with controlling it, and daily crucifying the human-selfish side, which is controlled by Satan. An offering made by fire is fasting. Fasting burns off fat and burns out the self of the human body. Thus, when the Bible says to give an offering made by fire it means fast, like in “Lev. 23:8: But ye shall offer an offering made by fire unto the “I AM” seven days: in the seventh day [is] an holy convocation: ye shall do no servile work [therein].” When Jesus fasted for 40 days and nights, he was tempted by Satan. Satan came in as a voice in Jesus’ head. Christ Jesus recognized it and rebuked him. This is what we must do. We must follow Christ’s Example in all ways. Satan could have made Jesus king of “his Babylonian Jerusalem, laced in Talmudic traditions”, simply by going into the crowds and whispering in their ears, “this is your guy.” Well, we know that didn’t happen. Jesus rejected Satan’s temptations; and did not switch to the dark side, to be handed a position of worldly-power and to live lavishly. Jesus instead held fast and listened to Father – the other voice, the quiet one, in His body’s head and trusted it. As far as the masses go in Jerusalem, they listened to an angered Satan (whose name is really Lucifer), who whispered, “hate this man, he is your enemy, and a blasphemer!” To the clergy, Satan said, “kill him, and take his inheritance.” And they plotted and planned. 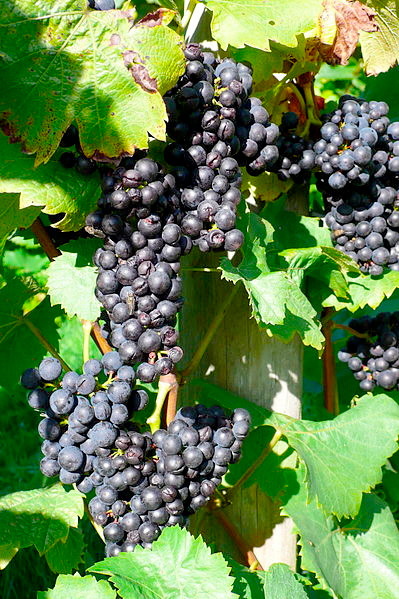 Jesus planned too, and planted some seeds, picking His own firstfruits, the disciples, and later giving them wisdom and understanding with the Holy Spirit – The Comforter. We should hold fast until this happens. But this means purifying ourselves “washing our garments” and holding fasts. A person should know when he or she needs to do it as a free-will offering. 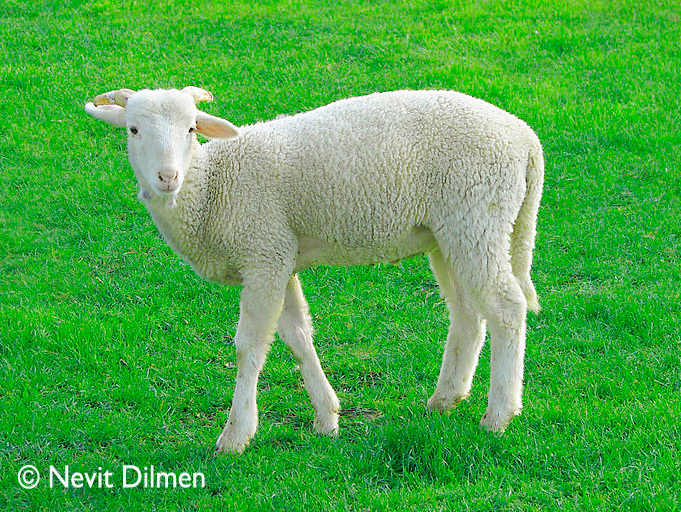 Leviticus describes what happens to an animal when it is sacrificed and burned. ALL of the fat is burned off. This fat is impure and holds toxins; and should not be part of the meat offering to God. God has instructed us to burn off the fat. We do this by fasting, because our bodies have to use-up this reserve food that shouldn’t be stored as fat and taken along on our journey. When a body fasts, it reduces; and its blood reduces in volume. This blood spiritually represents the blood that marks the doorposts and lintel. 109:21 But do Thou for me, O “I AM” the Lord, for Thy name’s sake: because Thy mercy [is] good, deliver Thou me. 109:24 My knees are weak through fasting; and my flesh faileth for lack of fatness. God said we’d forget the Holy Days; and we have. Not only have we forgotten about fasting, we do not honor His true Sabbath, the seventh day. “Six days shall work be done: but the seventh day [is] the Sabbath of rest, an holy convocation; ye shall do no work [therein]: it [is] the Sabbath of the “I AM” in all your dwellings (Lev. 23:3).” We are to stay in our dwelling and read His Word, sing His Song and teach it to others. In celebrating the Feasts, which were considered holy days, specific ones are set apart even more by including the aspect of no work, as indicated in the previous scripture, and are usually already a Sabbath. The first of the months should also be observed, like indicated with the seventh month and the blowing of trumpets, and the beginnings of our [months] or New Year’s Day (Numbers 10:10 and Deut. 12:1-2). New Year’s Day is March 17. The calendar presented with this article is based on the Holy Calendar given to Enoch, which sets the Sabbaths in their fixed places based on a solar year, because our months were supposed to be based on the sun, not new moons. It’s the difference in what the Hebrew word Chodesh (month) and Chadash (moon) mean. Setting Sabbaths by moons would change their fixed places – it was just a sneaky twist by some sneaky devils from days gone by, and the “traditions” they instilled in us. 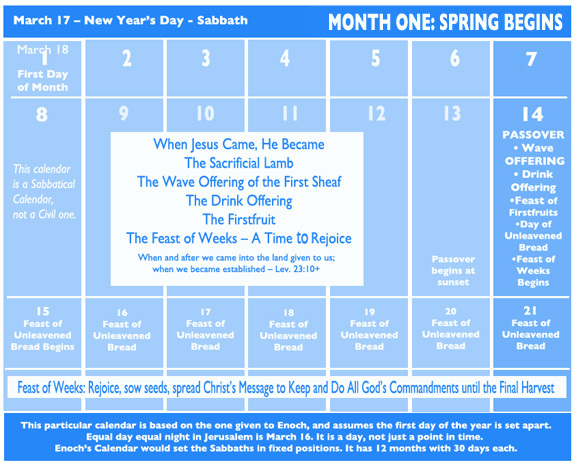 You will see that the two feast months line up perfectly with each other on Enoch’s Sabbatical Calendar. The real Druids, who were not pagans, but Levitical priests in exile in Ireland, knew the date and some of their knowledge also remains with us from days of old. Today, it has been relabeled as St. Patrick’s Day, and a new meaning assigned to it, just like they labeled Druid priests pagans. Sadly it has also, like Xmas, become a day of getting drunk, eating too much, committing adultery and sinning. God’s Kingdom moved to Ireland when Jeremiah planted Teia Tephi, there, after The Temple in Jerusalem’s second destruction. New Year’s Day is based on equal day time and equal night time in Jerusalem, which is the day before. 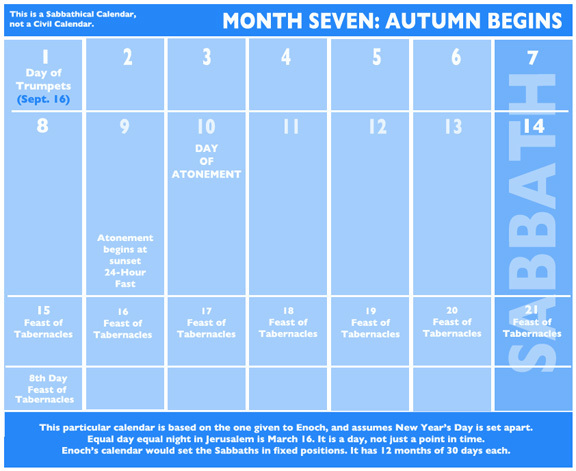 It is not “calculated” in the calendar, but is used to set the Sabbath Days. Enoch’s calendar is also based on 12 months with 30 days each, plus inserted days between the seasons, and one to be examined (see Enoch, Chapter 71+). It would be a good idea to study for oneself when Sabbaths should be, instead of taking it for granted by the moon-talkers and sun-worshippers. A Sabbathical calendar can be separate from the civil calendar; and maybe both need to be on the wall. For the Feast of the Tabernacles, we were supposed to get back to nature, away from city-life, just like we did when we entered the wilderness for forty years. The Bible talks about staying in booths during this time. Booths were tents. And in today’s time, one could have pitched a tent in their backyard and still can. The Feast of the Tabernacles falls in the seventh month. The first day of this month is the Blowing of Trumpets, which foreshadows the seventh trumpet of Revelation being blown. It is considered Holy, as is the tenth day – the Day of Atonement. This is a 24-hour fast from sunset to sunset, beginning at sunset on the ninth. This is then followed by a Feast beginning on the fifteenth. 1:10 Hear the Word of the “I AM”, ye rulers of Sodom; give ear unto the Law of our God, ye people of Gomorrah. 1:11 To what purpose [is] the multitude of your sacrifices unto Me? saith the “I AM”: I am sick of the burnt offerings of rams, and the fat of fed beasts; and I delight not in the blood of bullocks, or of lambs, or of he goats. 1:13 Bring no more worthless oblations; incense is an abomination unto Me; the new moons and Sabbaths, the calling of assemblies, I cannot abide; [it is] grief, even the solemn meeting. 1:14 Your new moons and your appointed feasts My soul hateth: they are a trouble unto Me; I am weary to bear [them]. 1:18 Come now, and let us reason together, saith the “I AM”: though your sins be as scarlet, they shall be as white as snow; though they be red like crimson, they shall be as wool. 1:20 But if ye refuse and rebel, ye shall be devoured with the sword: for the mouth of the “I AM” hath spoken [it]. 1:23 Thy princes [are] rebellious, and companions of thieves: every one loveth gifts, and followeth after rewards: they judge not the fatherless, neither doth the cause of the widow come unto them. and Matthew 23:23: Woe unto you, lawyers and politicians, hypocrites! for ye pay tithe of mint and anise and cummin, and have omitted the weightier [matters] of the Law, Judgment, Mercy, and Faith: these ought ye to have done, and not to leave the other undone. JAH also noted that Jesus said, “With desire I have desired to eat this Passover with you before I suffer: For I say unto you, I will not any more eat thereof, until it be fulfilled in the Kingdom of God (Luke 22:15-16).” The last days are about bringing in Justice and these days there is none. There isn’t going to be any miraculous healings as before. If men were true men of God, they would be girded and fighting for Truth and Justice for all, as they were Commanded to do. You would think that if the clergy from Jerusalem’s evil past showed up again to steal Christ’s inheritance and ours, that we’d have enough experience to see it and have no part in it. Or if Hitler and his crew showed up again with ideas about a Fourth Reich, Roman-styled, New World Order and world army, we’d have no part in it. Then, you’d be thinking wrongly, because they’re back. Everyone reincarnates – until Judgement Day. It’s best to fast from Satan and his grand ideas. To learn more about Christ as the Wave Offering from our sheaf field, please see “On the Way to Emmaus Again”. 9:8 And Moses said unto them, Stand still, and I will hear what the “I AM” will command concerning you. 9:10 Speak unto the children of Israel, saying, If any man of you or of your posterity shall be unclean by reason of a dead body, or [be] in a journey afar off, yet he shall keep The Passover unto the “I AM”. 9:11 The fourteenth day of the second month at even they shall keep it, [and] eat it with unleavened bread and bitter [herbs].